This Movistar 3G USB Modem is a ZTE Model: MF 190 which is used to connect to the 3G and 3G+ mobile internet network. The Movistar USB Modem (ZTE HSUPA USB Stick – Model: MF 190) is small, stylish black and lightweighted an is not much bigger than a USB memory stick. Posted by bioss at 6:00 pm on October 2nd, 2011. The Vodafone Mobile Connect USB Modem (Huawei K3565) is small, stylish white in colour and curved at the edges. While it has a discrete tray for the SIM and an additional slot for a microSD memory card, it is not much bigger than a USB memory stick. The modem light indicates the type of connection: green for GPRS connections, blue for UMTS/3G. occasionally you may need to retry to connect to your mail host or web server, depending on the network signal strength. Posted by bioss at 8:25 pm on September 27th, 2010. Network connections over a powerline (CPL) are a flexible solution to extend the link for a digital decoder or a wired lan connection. The dLAN 200 AVplus and the TP-LINK AV500 work well to extend the link between a Belgacom b-box 2 and the Belgacom decoder. This solution will work equally to extend a wired ethernet connection between a pc and the Belgacom b-box and b-box2. Here is a schema to extend your LAN over the in-house power circuit. 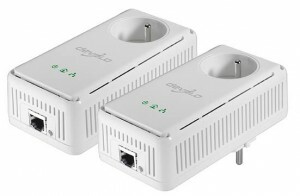 In the example below, the LAN connection from the ADSL-modem is extended by using the Devolo MicroLink dLAN Ethernet adapters. Be carefull with cheap powerline adapters, they may not be stable or may not support your (extended) in house power wiring. Posted by bioss at 5:30 pm on September 26th, 2010. Posted by bioss at 4:03 pm on September 19th, 2010. Posted by bioss at 3:46 pm on September 19th, 2010. Categories: support. Tags: internet, telecom. 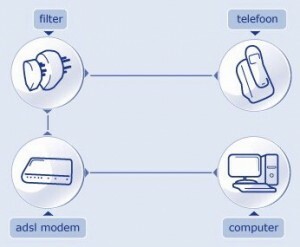 Use the ADSL-filter for each telephone connection ! Insert the filter between the telephone socket and the telephone, the fax or the answering machine (see picture 2 and 3 below). 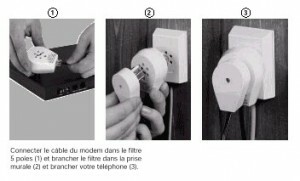 Note that the telephone wiring uses RJ-11 connectors. 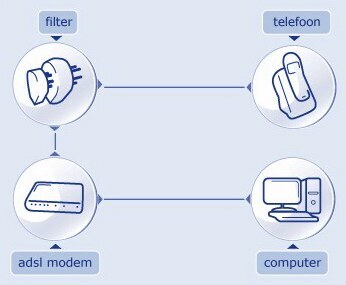 Check out the Belgian ADSL forum for information on ADSL providers. Posted by bioss at 10:51 am on February 6th, 2010. The RJ-11 cable is used for your telephone connection. Very often, only two wires are used to connect you phone line. Notice the difference between the RJ-11 here and the RJ-45, which is bigger. RJ-11 connectors are used for your ADSL connection. Posted by bioss at 10:26 am on February 6th, 2010. Posted by bioss at 10:15 pm on September 21st, 2009. The Philips ADSL modem/router PSTN Blue (as well as the PSTN Brown) is a multiservice router with a Wireless Access Point, offered by Belgacom. Posted by bioss at 8:33 pm on September 15th, 2009.